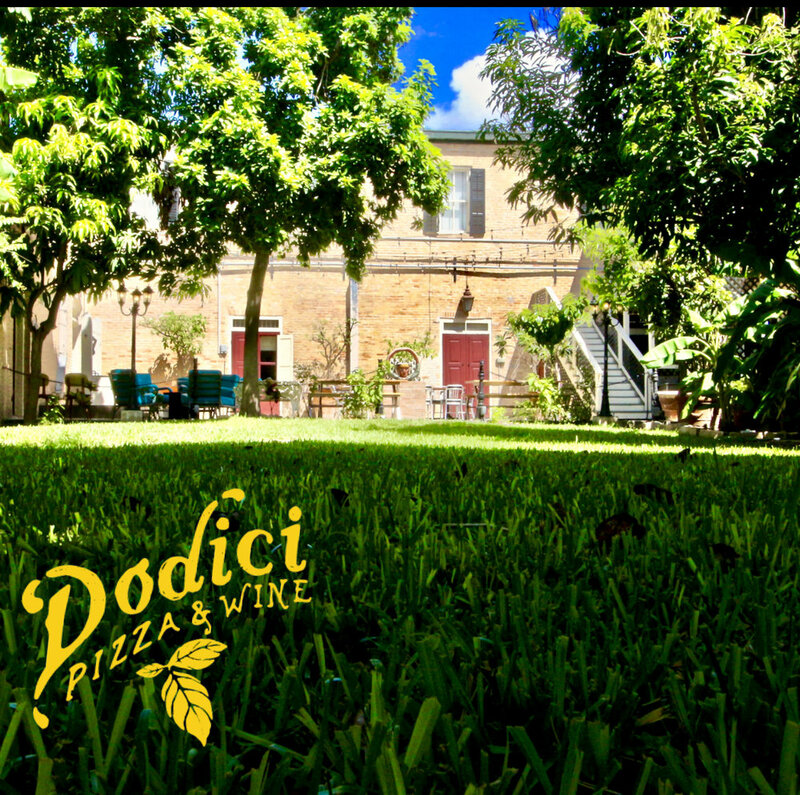 Located across from Market Square, Dodici strives to be a purveyor of good food and wine as well as a central part of downtown revitalization. Dodici Pizza + Wine serves delicious brick oven pizzas with a spectacular wine list to pair. Visit us 7 days per week. Juan H. Fernandez was born in 1859 in Villa de Llanes, Spain. He immigrated to the U.S. in 1878 and settled in the household of his uncle Jose. In 1880, his uncle left Brownsville, on an invitation to join the dynamic inner circle of Porfirio Diaz in Mexico, which he did in the manner of acquiring a coffee plantation in Huatusco, Veracruz. At that juncture, Juan H. sought to enter his own commercial enterprise, and began the venture of "Villa de Llanes" dry goods and ranch supplies with his elder brother, Jose. Shortly after receiving their inheritance, and after building the structure that is at Adams and 12th (1882), his elder brother died, leaving Juan H. as the sole head of the family holdings of that branch. He was immensely successful, as his uncle predicted. Within a few years, Villa de Llanes was the leading farm and ranch supply outlet in all of South Texas. One main character trait that Juan H. carried over in his business, as a result of his uncle's teachings was, "ALWAYS maintain compassion in your treatment of your customers". Juan H. married very late in his life. One fine day, he was at the doorway of his store and he look out to see a beautiful young (26 years younger) woman, Andrea Ortiz, standing in the doorway of the store diagonally to his on Adams. They married and eventually had at least five children, two of which were Juan H. Jr's. All would perish in extreme early childhood or a bit later of Tuberculosis, as was the scourge of the time. Only one daughter survived to marry, the mother of Skip Van Johnson Hodge. A: We serve made to order Neapolitan style pizza, as well as salads, appetizers and desserts. Q: How do you cook your pizza? A: Our pizza is cooked in a Stefano Ferrara brick oven, handcrafted in Naples, Italy. The oven cooks at a temperature of about 850-900 degrees fahrenheit. Q: What is Neapolitan pizza? A: Neapolitan pizza is the most authentic form of pizza making, originating back to Italy, the birthplace of pizza. Later variations of this pizza were made by Italians who arrived in America, thereby giving birth to "New York Style" pizza. A: We use a 00 Caputo flour from Italy, as well as peeled Italian tomatoes for our homemade red sauce. We have quality imported Italian meats, which we slice in-house on a daily basis. We focus as much as possible on locally sourced vegetables and the freshest cheeses possible. A: We are opening daily at 5 pm. We close at 10 during the week and at 11 on the weekends. We may eventually close one day during the week. A: 1200 East Adams in historic downtown Brownsville. We are proud to occupy the corner space at the JH Fernandez y Hermano building, a Registered Texas Historic Landmark. The building was built in 1883, and much of the original components of the building remain intact in our space. Q: Why does your pizza look "burned"? A: Our pizza isn't burned. In fact, the outer crust may sometimes have black dots, which is a reaction from the dough cooking at almost 900 degrees. Our dough is a special recipe that results in a puffier crust and soft inner portion so that the pizza hangs down a bit when you pick it up. This is perfectly normal and it should taste very good. However, if you actually taste ash or burned flavor on our pizzas, please let the server know. Q: What type of alcohol do you serve? A: We only sell wine and beer. We have a beautifully curated wine list with approximately 40 wines. Our beer list revolves a couple times per week, typically with as many as 20 beers on hand. A: Yes, we have a beautiful patio space located in the interior courtyard of the Fernandez y Hermano building. We have an occupancy limit of 49 outdoors, and there is no smoking permitted per City Ordinance. A: Due to limited seating, as well as high demand, guests are seated on a first come first served basis from Thursday- Saturday. We are currently only accepting reservations from Monday-Weds. A: Our pizzas are about 11-12" in diameter. Most people eat anywhere from 1/2 of a pizza (typically with an appetizer) to an entire pizza on their own. Q: Do you have gluten free pizza? A: Yes, we have gluten free pizza crusts available for a small upcharge. Q: Do you have a menu? A: Yes, please visit the menu portion of our website. We anticipate that our menu will change every few months. We also regularly feature off menu items that your server will let you know about.